African kente and textiles. Brass / Bronze / Lost wax. Oil paint / Ghana Signboards. Wood and other Artifacts. Art Movie posters Ghana. Tuareg Art and Crafts. Movie poster African cinema folk outsider art hand painted Ghana Species 3. SPECIES 3 Beautiful authentic hand-painted movie poster from Ghana, West Africa. DETAILS FOR THIS FILM AND POSTER: Film: SPECIES 3 HORROR Poster: Hand Painted in Ghana by SUNIL SHETTY for JK Video Club. Size: Art size 59″ x 41 1/2″ (149 cm x 105 cm). Condition: In average condition, in few many places the paint is off and with some signs of wear in the art work due to usage. This is not a print! Its a real oil paint! A real piece of Authentic African Art! This type of posters are highly collectible and many times displayed in Museums all over the world! With the arrival of video and video cassettes during 1980s In Ghana (West Africa) a small-scale film distribution / mobile Cinema was created. This small size mobile “Cinema” operators were equipped with a television a Video and sometimes with a small portable generator and were moving from town to town from village to village operating and showing their films! (During the day inside social clubs or houses and during the night in the open air). In order to attract more customers and in order to advertise their mission and business the need of huge posters was created and born. Talented artists after viewing the film were creating large size posters using oil paint on canvas (Because of unavailability and high cost of imported canvas , The artists were using used flour sacks sewn together). The artist had the freedom to add or change scenes seen or not seen in the film in order to make the poster more attractive (This is the reason that this hand painted posters are more interesting as ART than the normal posters since each of this hand painted poster is UNIQUE and except the film content it also express the artist himself). These posters were rolled or folded and easy to move around with the mobile Cinema. Because of the posters ” hard ” life (Folded or rolled, under the rain and sun and display for several months during their rounds all over Ghana) most of the surviving posters have damage at the end of the canvas, peelings, cracking and other damages. By the mid 1990s the mobile Cinema business declined and almost collapsed since television and video was more widely available in Ghana. The profits of the mobile Cinema operators were also reduced and they were not able to afford the “expensive” talented artists to paint their posters anymore. At the present days they have to rely with Photocopy paper posters in order to survive and reduce cost. For more information concerning this type of art please read: ” Extreme Canvas: Hand-Painted Movie Poster from Ghana ” with over 350 colorful examples of this unique posters. Sign up to our newsletter for special deals. Powered by SixBit’s eCommerce Solution. The item “Movie poster African cinema folk outsider art hand painted Ghana Species 3″ is in sale since Thursday, June 14, 2018. This item is in the category “Art\Art Posters”. The seller is “ethnic*art*gallery” and is located in GR. This item can be shipped worldwide. African kente and textiles. Brass / Bronze / Lost wax. Oil paint / Ghana Signboards. Wood and other Artifacts. Art Movie posters Ghana. Tuareg Art and Crafts. Movie poster African cinema folk wall art hand painted Ghana Occultic Wedding. 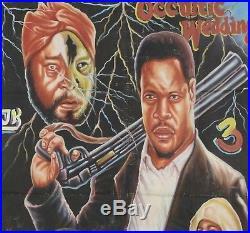 OCCULTIC WEDDING 3 Beautiful authentic hand-painted movie poster from Ghana, West Africa. DETAILS FOR THIS FILM AND POSTER: Film: OCCULTIC WEDDING 3 African – Ritual – JuJu – Black magic film. Poster: Hand Painted in Ghana by ARMAHSCO for JK video. Art size 60″ x 38 1/2″ (152 cm x 98 cm). Condition: In good condition with a few damages, some repairs, in some places the paint is off and some wear in the art work due to usage. This is not a print! Its a real oil paint! A real piece of Authentic African Art! This type of posters are highly collectible and many times displayed in Museums all over the world! With the arrival of video and video cassettes during 1980s In Ghana (West Africa) a small-scale film distribution / mobile Cinema was created. This small size mobile “Cinema” operators were equipped with a television a Video and sometimes with a small portable generator and were moving from town to town from village to village operating and showing their films! (During the day inside social clubs or houses and during the night in the open air). In order to attract more customers and in order to advertise their mission and business the need of huge posters was created and born. Talented artists after viewing the film were creating large size posters using oil paint on canvas (Because of unavailability and high cost of imported canvas , The artists were using used flour sacks sewn together). The artist had the freedom to add or change scenes seen or not seen in the film in order to make the poster more attractive (This is the reason that this hand painted posters are more interesting as ART than the normal posters since each of this hand painted poster is UNIQUE and except the film content it also express the artist himself). These posters were rolled or folded and easy to move around with the mobile Cinema. Because of the posters ” hard ” life (Folded or rolled, under the rain and sun and display for several months during their rounds all over Ghana) most of the surviving posters have damage at the end of the canvas, peelings, cracking and other damages. By the mid 1990s the mobile Cinema business declined and almost collapsed since television and video was more widely available in Ghana. The profits of the mobile Cinema operators were also reduced and they were not able to afford the “expensive” talented artists to paint their posters anymore. At the present days they have to rely with Photocopy paper posters in order to survive and reduce cost. For more information concerning this type of art please read: ” Extreme Canvas: Hand-Painted Movie Poster from Ghana ” with over 350 colorful examples of this unique posters. Sign up to our newsletter for special deals. Powered by SixBit’s eCommerce Solution. The item “Movie poster African cinema folk wall art hand painted Ghana Occultic Wedding” is in sale since Sunday, October 1, 2017. This item is in the category “Art\Art Posters”. The seller is “ethnic*art*gallery” and is located in GR. This item can be shipped worldwide. African kente and textiles. Brass / Bronze / Lost wax. Oil paint / Ghana Signboards. Wood and other Artifacts. Art Movie posters Ghana. Tuareg Art and Crafts. Movie poster African cinema folk outsider art hand painted Ghana Drunken monkey. DRUNKEN MONKEY Beautiful authentic hand-painted movie poster from Ghana, West Africa. 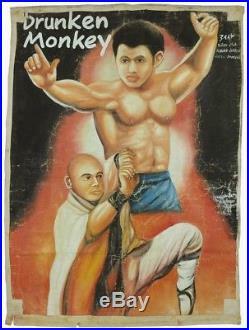 DETAILS FOR THIS FILM AND POSTER: Film: DRUNKEN MONKEY MARTIAL ARTS / ACTION Poster: Hand Painted in Ghana by ” LEONARDO” for ZAAP Video Size: Art size: 58″ x 43″ (147 cm x 109 cm) Condition: In good condition, with some damages, some repairs, small size holes, in some places the paint is off and signs of wear in the art work due to usage. This is not a print! Its a real oil paint! A real piece of Authentic African Art! This type of posters are highly collectible and many times displayed in Museums all over the world! With the arrival of video and video cassettes during 1980s In Ghana (West Africa) a small-scale film distribution / mobile Cinema was created. This small size mobile “Cinema” operators were equipped with a television a Video and sometimes with a small portable generator and were moving from town to town from village to village operating and showing their films! (During the day inside social clubs or houses and during the night in the open air). In order to attract more customers and in order to advertise their mission and business the need of huge posters was created and born. Talented artists after viewing the film were creating large size posters using oil paint on canvas (Because of unavailability and high cost of imported canvas , The artists were using used flour sacks sewn together). The artist had the freedom to add or change scenes seen or not seen in the film in order to make the poster more attractive (This is the reason that this hand painted posters are more interesting as ART than the normal posters since each of this hand painted poster is UNIQUE and except the film content it also express the artist himself). These posters were rolled or folded and easy to move around with the mobile Cinema. Because of the posters ” hard ” life (Folded or rolled, under the rain and sun and display for several months during their rounds all over Ghana) most of the surviving posters have damage at the end of the canvas, peelings, cracking and other damages. By the mid 1990s the mobile Cinema business declined and almost collapsed since television and video was more widely available in Ghana. The profits of the mobile Cinema operators were also reduced and they were not able to afford the “expensive” talented artists to paint their posters anymore. At the present days they have to rely with Photocopy paper posters in order to survive and reduce cost. For more information concerning this type of art please read: ” Extreme Canvas: Hand-Painted Movie Poster from Ghana ” with over 350 colorful examples of this unique posters. Sign up to our newsletter for special deals. Powered by SixBit’s eCommerce Solution. 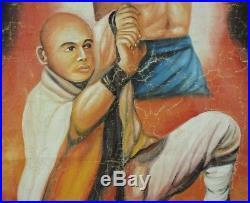 The item “Movie poster African cinema folk outsider art hand painted Ghana Drunken monkey” is in sale since Friday, March 15, 2013. This item is in the category “Everything Else\Weird Stuff\Totally Bizarre”. The seller is “ethnic*art*gallery” and is located in GR. This item can be shipped worldwide. African kente and textiles. Brass / Bronze / Lost wax. Oil paint / Ghana Signboards. Wood and other Artifacts. Art Movie posters Ghana. Tuareg Art and Crafts. Movie poster African Ghana oil painting cinema folk art hand painted Dracula 2. DRACULA 2 Beautiful authentic hand-painted movie poster from Ghana, West Africa. 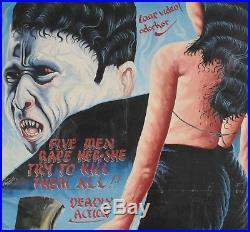 DETAILS FOR THIS FILM AND POSTER: Film: DRACULA 2 HORROR Poster: Hand Painted in Ghana by O. A HEAVY J for 1st PAIGE Video club. Size: Art size 53 1/2″ x 39 1/2″ (136 cm x 100 cm). Condition: In very good condition with the exception of few small size holes, in some places the paint is off and some wear in the art work due to usage. This is not a print! Its a real oil paint! A real piece of Authentic African Art! This type of posters are highly collectible and many times displayed in Museums all over the world! With the arrival of video and video cassettes during 1980s In Ghana (West Africa) a small-scale film distribution / mobile Cinema was created. This small size mobile “Cinema” operators were equipped with a television a Video and sometimes with a small portable generator and were moving from town to town from village to village operating and showing their films! (During the day inside social clubs or houses and during the night in the open air). In order to attract more customers and in order to advertise their mission and business the need of huge posters was created and born. Talented artists after viewing the film were creating large size posters using oil paint on canvas (Because of unavailability and high cost of imported canvas , The artists were using used flour sacks sewn together). The artist had the freedom to add or change scenes seen or not seen in the film in order to make the poster more attractive (This is the reason that this hand painted posters are more interesting as ART than the normal posters since each of this hand painted poster is UNIQUE and except the film content it also express the artist himself). These posters were rolled or folded and easy to move around with the mobile Cinema. Because of the posters ” hard ” life (Folded or rolled, under the rain and sun and display for several months during their rounds all over Ghana) most of the surviving posters have damage at the end of the canvas, peelings, cracking and other damages. By the mid 1990s the mobile Cinema business declined and almost collapsed since television and video was more widely available in Ghana. The profits of the mobile Cinema operators were also reduced and they were not able to afford the “expensive” talented artists to paint their posters anymore. At the present days they have to rely with Photocopy paper posters in order to survive and reduce cost. For more information concerning this type of art please read: ” Extreme Canvas: Hand-Painted Movie Poster from Ghana ” with over 350 colorful examples of this unique posters. Sign up to our newsletter for special deals. Powered by SixBit’s eCommerce Solution. The item “Movie poster African Ghana oil painting cinema folk art hand painted Dracula 2″ is in sale since Thursday, January 4, 2018. This item is in the category “Art\Art Posters”. The seller is “ethnic*art*gallery” and is located in GR. This item can be shipped worldwide. African kente and textiles. Brass / Bronze / Lost wax. Oil paint / Ghana Signboards. Wood and other Artifacts. Art Movie posters Ghana. Tuareg Art and Crafts. 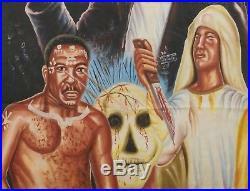 Movie poster African Ghana oil cinema folk art hand painted I spit On Your Grave. 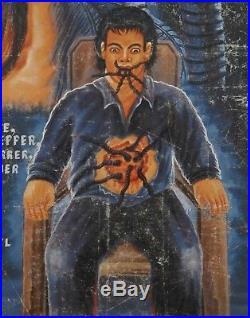 I SPIT ON YOUR GRAVE Beautiful authentic hand-painted movie poster from Ghana, West Africa. DETAILS FOR THIS FILM AND POSTER: Film: I SPIT ON YOUR GRAVE HORROR Poster: Hand Painted in Ghana by PAPAWARSTI for “ZAAP” Video. Art size 62 1/4″ x 40 3/4″ (158 cm x 103 cm). Condition: In very good condition with the exception of a couple of holes, in some places the paint is off and signs of wear in the art work due to usage. This is not a print! Its a real oil paint! A real piece of Authentic African Art! This type of posters are highly collectible and many times displayed in Museums all over the world! With the arrival of video and video cassettes during 1980s In Ghana (West Africa) a small-scale film distribution / mobile Cinema was created. This small size mobile “Cinema” operators were equipped with a television a Video and sometimes with a small portable generator and were moving from town to town from village to village operating and showing their films! (During the day inside social clubs or houses and during the night in the open air). In order to attract more customers and in order to advertise their mission and business the need of huge posters was created and born. Talented artists after viewing the film were creating large size posters using oil paint on canvas (Because of unavailability and high cost of imported canvas , The artists were using used flour sacks sewn together). The artist had the freedom to add or change scenes seen or not seen in the film in order to make the poster more attractive (This is the reason that this hand painted posters are more interesting as ART than the normal posters since each of this hand painted poster is UNIQUE and except the film content it also express the artist himself). These posters were rolled or folded and easy to move around with the mobile Cinema. Because of the posters ” hard ” life (Folded or rolled, under the rain and sun and display for several months during their rounds all over Ghana) most of the surviving posters have damage at the end of the canvas, peelings, cracking and other damages. By the mid 1990s the mobile Cinema business declined and almost collapsed since television and video was more widely available in Ghana. The profits of the mobile Cinema operators were also reduced and they were not able to afford the “expensive” talented artists to paint their posters anymore. At the present days they have to rely with Photocopy paper posters in order to survive and reduce cost. For more information concerning this type of art please read: ” Extreme Canvas: Hand-Painted Movie Poster from Ghana ” with over 350 colorful examples of this unique posters. Sign up to our newsletter for special deals. Powered by SixBit’s eCommerce Solution. 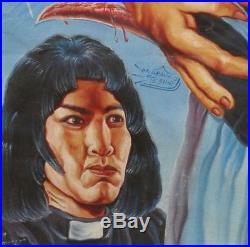 The item “Movie poster African Ghana oil cinema folk art hand painted I spit On Your Grave” is in sale since Wednesday, February 07, 2018. This item is in the category “Art\Art Posters”. The seller is “ethnic*art*gallery” and is located in GR. This item can be shipped worldwide. African kente and textiles. Brass / Bronze / Lost wax. Oil paint / Ghana Signboards. Wood and other Artifacts. Art Movie posters Ghana. Tuareg Art and Crafts. 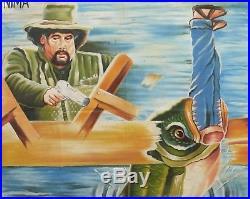 Movie poster African Ghana oil painting cinema folk art hand painted FRANKENFISH. 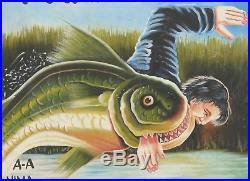 FRANKENFISH Beautiful authentic hand-painted movie poster from Ghana, West Africa. DETAILS FOR THIS FILM AND POSTER: Film: FRANKENFISH HORROR Poster: Hand Painted in Ghana for A-A NIMA Video club. Size: Art size 66 1/2″ x 40 3/4″ (168 cm x 103 cm). Condition: In very good condition with the exception of few small size holes, in some places the paint is off and some wear in the art work due to usage. This is not a print! Its a real oil paint! A real piece of Authentic African Art! This type of posters are highly collectible and many times displayed in Museums all over the world! With the arrival of video and video cassettes during 1980s In Ghana (West Africa) a small-scale film distribution / mobile Cinema was created. This small size mobile “Cinema” operators were equipped with a television a Video and sometimes with a small portable generator and were moving from town to town from village to village operating and showing their films! (During the day inside social clubs or houses and during the night in the open air). In order to attract more customers and in order to advertise their mission and business the need of huge posters was created and born. Talented artists after viewing the film were creating large size posters using oil paint on canvas (Because of unavailability and high cost of imported canvas , The artists were using used flour sacks sewn together). The artist had the freedom to add or change scenes seen or not seen in the film in order to make the poster more attractive (This is the reason that this hand painted posters are more interesting as ART than the normal posters since each of this hand painted poster is UNIQUE and except the film content it also express the artist himself). These posters were rolled or folded and easy to move around with the mobile Cinema. Because of the posters ” hard ” life (Folded or rolled, under the rain and sun and display for several months during their rounds all over Ghana) most of the surviving posters have damage at the end of the canvas, peelings, cracking and other damages. By the mid 1990s the mobile Cinema business declined and almost collapsed since television and video was more widely available in Ghana. The profits of the mobile Cinema operators were also reduced and they were not able to afford the “expensive” talented artists to paint their posters anymore. At the present days they have to rely with Photocopy paper posters in order to survive and reduce cost. 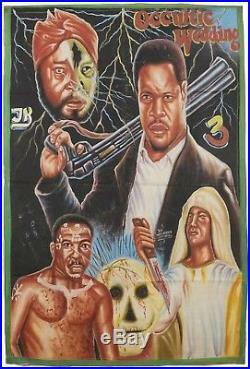 For more information concerning this type of art please read: ” Extreme Canvas: Hand-Painted Movie Poster from Ghana ” with over 350 colorful examples of this unique posters. Sign up to our newsletter for special deals. Powered by SixBit’s eCommerce Solution. 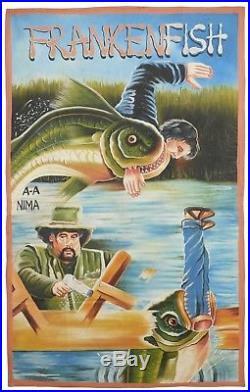 The item “Movie poster African Ghana oil painting cinema folk art hand painted FRANKENFISH” is in sale since Tuesday, January 09, 2018. This item is in the category “Art\Art Posters”. The seller is “ethnic*art*gallery” and is located in GR. This item can be shipped worldwide.